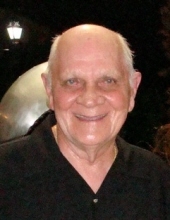 Celebrating the life of Ronald E. Lentz Sr.
Obituary for Ronald E. Lentz Sr.
Ronald Emil Lentz, 86, resident of Naperville, formerly of Florida, passed away peacefully on Wednesday, April 10, 2019 at Tabor Hills Healthcare. Born September 2, 1932 in Chicago, IL to his late parents, Emil and Emma Lentz. Cherished husband of the late Annette Louise Lentz, wedded on September 6, 1952. Annette passed away only 6 weeks earlier on February 25, 2019. Beloved father of Ronald E. (Julienne) Lentz, Jr. of Naperville and the late Linda (the late David) Ippel. Adored grandpa of Bryan Ippel, Brooke (Michael) Jacobs, and AJ (Wes) Mottlau. Devoted great grandpa of Kamryn, Annalyn, Brynlee, Barrett and the late Hadley. Dearest brother of Erna and Ruth. Ron Sr. grew up in Chicago and attended South Shore High School. He worked at US Steel as a mill electrician. Through the years, he became a construction electrician and did other jobs as a carpenter. When they moved to Florida, he became a realtor. After he retired, he enjoyed being a greeter at Sea World. Ron Sr. did several fundraisers with Annette for Make-A-Wish Illinois while living at Shorewood Glen. He loved to work on building projects for him and mom, and especially for his daughter’s and son’s homes. He was a fun-loving ‘jokester’ and loved to kid everyone including his family. He enjoyed dancing, playing pinochle and other card games. He was an avid reader with a wide range of books from political to Joel Osteen. He never started his morning without a cup of black coffee while reading the newspaper end to end. He was a proud Cubs Fan, Blackhawks Fan, and Bears Fan. He also enjoyed traveling abroad with his family. Due to previously scheduling Annette’s Memorial for Saturday, April 20, 2019, the family has chosen to honor them both by memorializing them together. Annette and Ronald were inseparable in life during their 66 years. The family will be honoring their loved ones by dressing in Annette’s and Ron’s favorite Chicago sports teams. We ask that people feel comfortable wearing Cubs, Bears, or Blackhawks clothing. Please choose any attire which you feel appropriate wearing. In lieu of flowers, Memorial Contributions may be made easily to Make-A-Wish Illinois, by scrolling down and clicking on visit website under Memorial Contributions. Memorial Visitation: Saturday, April 20, 2019 from 1:00-3:00 PM. To send flowers or a remembrance gift to the family of Ronald E. Lentz Sr., please visit our Tribute Store. "Email Address" would like to share the life celebration of Ronald E. Lentz Sr.. Click on the "link" to go to share a favorite memory or leave a condolence message for the family.